Regardless of your visual requirements, you should not have to compromise your style for visual acuity! We are here to help you evey step of the way when selecting your new eyeglasses or sunglasses. The material and type of lens you choose, will have many dependencies, such as your prescription, preferred frame style, frame type, lifestyle activities, facial measurements, and most importantly, the recommendation of your eye care professional. For the safety of your eyes, we do not recommend glass lenses. Modern technology has created lenses that bend light differently so that stronger corrections are thinner than when made in conventional materials. Such lenses are called "high index" and stronger corrections are more attractive because they are slimmer. High index plastic uses less material so they are significantly lighter in weight. High index lenses absorb all harmful UV light and can be tinted to any shade or color. Transition® Lenses are "Light Intelligent Lenses" and seamlessly adapt to changing light, from clear indoors to dark outdoors, and every shade in between. Polycarbonate lenses are the most impact resistant lenses available and are always the lens of choice for young people and active patients. Polycarbonate lenses are high index and are usually the lightest, most comfortable lenses. They absorb almost all harmful UV light and can be made with ultra thin edges because of their unique strength. For decades glass was the only lens material available. The most scratch-resistant material, the primary disadvantage of glass is its weight, as they are much heavier than other materials. Glass lenses are heat or chemically treated to increase impact resistance, bu t not as strong as Polycarbonate or plastic lenses. Even though glass lenses can be heat and chemically treated to increases strength, we highly recommend against glass lenses because of their propensity to shatter in many situations. Single vision lenses function as all purpose lenses for people who have normal accommodation. Single vision lenses can also function as occupational lenses for certain types of work. Single vision lenses are available in all lens materials. These lenses provide special visual and cosmetic benefits for stronger corrections and increase edge to edge clarity. Flatter than conventional lenses, aspheric lenses eliminate the "bulgy" appearance of strong plus lenses (far-sighted corrections) and greatly enhance the appearance of finished eyewear. People with strong nearsighted corrections also benefit from thinner, lighter weight glasses when their lenses are aspheric. There is less eye magnification with farsighted corrections and less "small eyes" look with nearsighted corrections. Aspheric lenses are often made of high index materials for the ultimate in thin lenses. This is an older style bifocal form and has limited compatibility with many of today's lens upgrades. The bifocal portion is made in a variety of widths to help with various close-up occupations. Aesthetically and functionally they are older styles and are inferior to progressive lenses Flat top bifocals are made in every type of lens material. These lenses provide all the benefits of bifocals but add the feature of continuous clear vision at all distances, including mid-range distance (arm's length). Progressives have the cosmetic advantage of appearing to be single vision lenses so they never reveal the user wears bifocals. Progressives are available in all lens materials and also made in aspheric form. 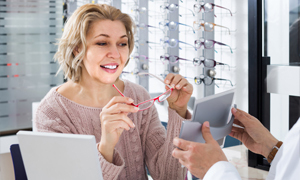 Because of their many benefits, they are the lens of choice for bifocal and trifocal wearers. Special lenses designed for active people are available for the specific needs of sports enthusiasts. Polycarbonate is usually the material of choice for active sports. Wearing protective eyewear for sports is a must in any sport. With the proper glasses, the risk of eye damage may reduce eye injury and in many cases performance is enhanced with crisper and more accurate vision. For debilitating sunlight and glare, these are the lensess that eliminate reflected glare and improve visual comfort. They are especially appropriate for drivers, fisherman, hunters and all types of outdoors activities. However, there are some occupations, such as pilots, that may require a worker to be able to read certain digital numbers on a liquid crystal display on equipment. These lenses will block liquid crystal displays. Though an anti-scratch coating is not 100% scratch-proof, it helps to prevent scratches that can easily happen to a lens on normal wear and tear. These scratches can damage the surface of the lens and impair vision. Special coatings have been developed to help protect lenses from normal scratching. The modest additional procedure is a very a prudent investment. It is generally accepted that the ultraviolet rays in sunlight pose potential harm to the eyes. Just like sunscreen for your skin keeps the sun's UV rays from harming your skin, UV-protective treatments for eyeglass lenses block those same rays from damaging your eyes. Lenses like polycarbonate and high index include built-in UV protection. Special anti-reflective coatings are available for almost all lenses, but are especially beneficial on high-index lenses, which reflect more light than regular resin lenses. These coatings are particularly effective for reducing eye fatigue for computer operators and anyone driving at night. And, of course, AR lenses enhance appearance by removing all distracting reflections. AR improves the sight efficiency since less light is lost.